Secure a piece of stretchy floss near hook eye leave some space for head. Stretch floss and wrap down to bend of hook. Keep tag ends long for easy trimming. Cut stretchy floss just short of hook eye. Split the unwaxed dental floss and tie in a piece which extends either side of hook. Wrap the dental floss down to hook bend and then build up a tapered body with thread. Make a small loop with dental floss at hook eye (double up thichness) and wrap so dental floss stands upright. Wind stretchy from hook bend towards eye reducing strech as you get closer to hook eye. Secure stretchy and build up thorax with thread. You can add an optional flashback strip over thorax if desired. Tie in strechy at head and wrap this down on the underside of hook back to rear of thorax. Take these two tag ends and tie them in at the head as wing cases. Cut off surplus stretchy. Build up head. Tie off carefully. Coat the body with Loon flow. Trim dental floss on each end as desired. 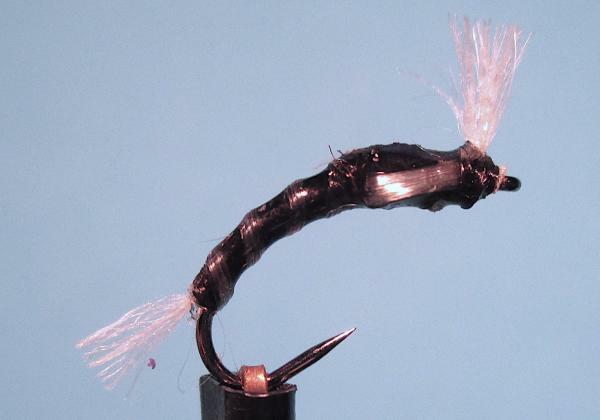 This fly is best used on a floating line on a long leader and this will allow the fly to sit upright and bob around with the waves mimicking the natural.